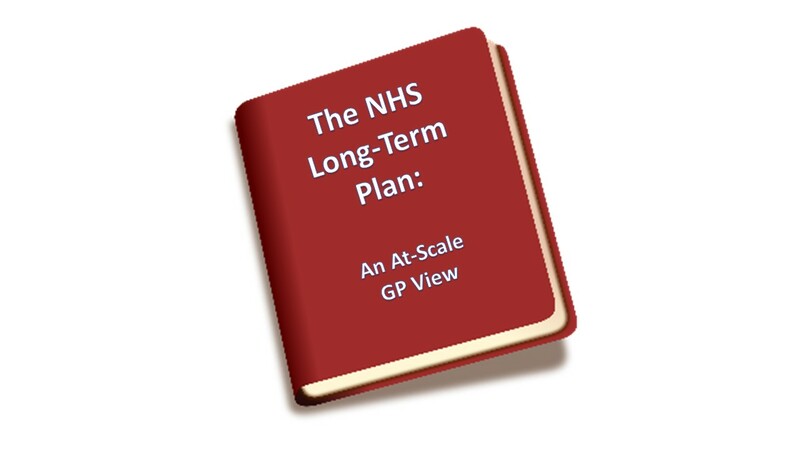 I’m a long-term cynic when it comes to NHS long-term plans. They’re usually unnaturally narrow, overly prescriptive and with the flexibility of a Soviet Five Year Plan. This new one is different: it’s broad (scattergun broad in places), with vision statements instead of hard plans, and enough scope for local areas to interpret this in a way that makes it work for their area. Be open when you read it, if you don’t like one part then don’t write off the entire plan. The sections below are my commentary on each chapter in the plan, concentrating on Chapter 1 and putting a very strong at-scale bias on it. The focus around Primary Care Networks (PCNs) is interesting as it’s a deliberate step away from discussing “providers” and into defining geographically bound GP-led organisations. There is almost no other way they could have phrased this without allowing a way-in for out-of-area and private company poaching of work. How this is funded is a different question, as it’s vague. I would prefer a capitated block budget with a deprivation supplement (see Chapter 2 notes). It will be interesting to see how this will work with looking-out GP Federations mixed with looking-in PCNs. Additionally, it refers to CCG procured “enhanced” services. This is a particular issue of mine as cash-rich CCGs can afford lots of these enhanced services while cash-poor ones can’t. It’s a built-in inequality that directly impacts the way clinicians can offer patient care. It would be good to see a national index of enhanced services offered in each area. Maybe this is something for NHSE to do, enabling GPs and providers to hold CCGs to account for the reduced capabilities they have. A very welcome change in this Plan is the addition of “shared savings” where GPs and PCNs will be rewarded by getting part of any savings made in other care settings. There is now a focus on “digital first” for GPs. I think this partially misses the point as it does not account for the system-wide savings through continuity of care in General Practice. Neither does it work for the “have-nots” of society who can’t or won’t use technology. This is where GPs must step up and be the patient advocates for the have-nots, especially in deprived areas. I would recommend a priority for GPs is to address this themselves to protect their own service. For example, it’s allowable in this for patients to be offered telephone appointments OR online conference ones. Show that you offer patients a teleconference option and change your model to prioritising it and you’ll be half-way to meeting this objective. Do it yourselves or you’ll find it mandated and patients going elsewhere under promises of remote unicorns of same-day GP appointments by phone. The outpatient redesign part of this chapter concerns me as, unless it’s done properly, it’ll result in General Practice being dumped with patients overly quickly discharged or there being clear rationing or higher bars on referring patients. The Plan risks getting this wrong. Patients don’t just go away because they can’t get a referral to hospital. Another aspect of ICS is the move to Integrated Care Provider contracts. This will require legislative change to enable, but will effectively shortcut alliances of NHS public providers into formal status while also allowing a complete removal of the necessity for procurement for work in the area. A concern is the Plan suggests only allowing this for statutory bodies. While this will exclude the big private providers, such as Virgin, it will also exclude GP Federations. Much is required to make this work, and the elephant in the room of Brexit makes legislative changes unlikely for quite a while. This chapter concerns itself with the prevention agenda and addressing health inequalities. It does it very well and makes a strong case for addressing deprivation related health inequalities. For this alone, this Plan succeeds and deserves support. The Plan is clear that more funds will be targeted at areas with high deprivation and high health inequalities. The concern for many areas with high deprivation is that they’re often grouped with areas of middling or low deprivation and any aggregation of their “scores” would see a loss of any such deprivation premium. I would like to see a central strategy of highlighting discrete areas of high deprivation and high health inequalities and mandating special funding for them. A secondary, but just as important, strategy is that this extra money must not be allowed to be diluted across an ICS/system; it must be provided to help health inequalities among the most deprived patients in England, not to give extra to areas that don’t need as much help. This chapter is a mixed bag of strong content matching chapter 2 and defensiveness over the consequences of previous decisions. The cancer prevention and early diagnosis parts of this Plan fall heavily on primary care with extra resources being made available for urgent referrals and diagnostic tests. It will put pressure on GPs to deal with the turnaround and meet targets but it is achievable and will help patients. A critical component is the funding though and ensuring it comes before the targets. There’s a strong focus on mental health with distinctions between CYP and adult MH, as well as plans for addressing the current service gap of 18-25-year-old patients moved from CAMHS to adult MH services. Much of the load from this will land on primary care through IAPT extensions, and it’s worth dedicating time to what this will mean for both individual practices and at-scale General Practice. I’d recommend that GP Federations make this a core part of any clinical strategy they’re developing. One thing that will benefit patients is the commitment to get 70% of acute hospitals to the Core 24 standard on emergency MH support by 2023/4 and then to 100%. This will give GPs a much needed emergency referral source that is missing at present across the greatest part of England. The less good side is learning development and autism where the plan seems disjointed and is proud of the fact that inpatient provision will be halved by 2023/4 considering that it was already effectively cut in half from its 2010 numbers by 2015. As always, the load from these patients moved back to the community risks landing on primary care and often take GP time. Again, we need a GP at-scale strategy for these patients to treat them with the dignity and care they deserve while also not impacting overall workloads. The relatively low numbers would suggest this may be best dealt with in practices with at-scale support. Interestingly, there are some changes to the planned vs urgent care model that will help primary care. There are plans to provide funding for increased planned care capacity, but not necessarily in acute hospitals. This is a welcome change from the now habitual “cut referrals” strategy to reduce waiting lists. Also, there are plans to force physical separation between urgent/emergency care and planned care so that disruptions such as winter pressures will have fewer major impacts on planned care. This would be a major expense though, and I doubt the government will provide the capital needed for the physical building separations. Of greatest importance to GPs in this section is the confirmation that GP indemnity will be cost neutral. This means it will be paid for but then clawed back through other parts of GP funding, most likely GMS/PMS contracts. The remainder of chapter 4 shows this is the weakness of the whole Plan. It needs a robust workforce strategy and struggles without it. Treat this chapter as a placeholder for the proper strategy later. There is too much concentration on the centralised functions writing the plans and far too little recognition that it’s locally that workforce fails when grand strategies are applied. It also shies away from changing previous poor decisions, such as materially defunding the NHS Leadership Academy, but talks about improving training & CPD coverage. There’s some blank cheques written in this section that recognise the aims of the Health Secretary, but these haven’t yet been fleshed out beyond bare skeletons. A key example is the paragraph about improving IT to make work more satisfying (“faster, better and more reliable”). Yet with no ideas on how they’ll do that when programme after programme has failed to touch the subject. It also fails to deal with the massive infrastructure upgrade of resilience that is essential if the NHS is moving away from on-site presence to off-site coverage. If a system goes down or is slow when the patient and clinician are face-to-face then it’s often simple to work around; if a system goes down when it’s a virtual consultation then it usually stops. This is a massive expense, based on my own experience of grand-scale upgrades, doubling the capital IT budget for a few years MIGHT just achieve this. There’s no getting away from this, to make it “faster, better and more reliable” will require huge and probably politically unbearable capital investment with revenue uplifts. The Plan bakes in a 1.1% annual “productivity growth” dividend. This is unlikely as there’s very little “fat” left in the system. The NHS as it stands is far more efficient than the vast majority of even the best private sector organisations. Any more cuts will be right into muscle. It does make an interesting comment that community care clinical staff spend more time doing admin and non-patient facing work than patient-facing work. I would put that this is a recognition that admin cuts have gone too far and investment in specialist admin staff and tools would more than repay themselves in freed time to deal with patients. Finally, it makes the point that the central admin budgets of the NHS, including provider Trusts, will be expected to be cut by £700m/year. Again, from where? An interesting point here is the Plan’s aim to provide five-year indicative budgets. My hope is that this will remove the year-by-year short-termism of the NHS and allow long-term efficient and multi-year budgets. This is an area where Federations and private providers can outperform the NHS at present as we’re not bound by in-year spending of funds. It will only be good for the rest of the NHS to catch up. The legislative changes required to make this plan work are also interesting. The bits that impact at-scale General Practice are around the ICS/ICP and integrated care Trusts and the removal of procurement mandates. The latter would allow CCGs to make direct contracting between NHS organisations easier and remove the significant wasted costs we see in NHS procurements of very low-level services. Both are items that should gain strong support and advocacy from GP at-scale groups. I hope some readers are still here! As a bonus to those of you who made it, I noted two major areas that this Plan misses that I’d hope would make it. Point 1: National detailed minimum standards of care matched to local needs. Targets are fine in their own way (same with CQC inspections) but they’re negative and, regardless of what they say, just are not patient focussed. I would like a grand programme that sets standards of care across all health issues and provokes discussion on prioritisation for care to help the NHS set its own localised plans. For example, what’s unique about a deprived area’s health inequalities that explains WHY it has lower levels for patient care? What does that mean and how does the area plan to meet, and exceed, national minimum standards of care? Long-term local plans should then be externally funded for removing health inequalities matched with central funding for delivery that supplements local commissioning funding. Point 2: Demand analysis. The NHS is woefully unaware of its actual demand. How many patients don’t bother when they can’t get a GP appointment? How many GPs won’t refer clearly ill patients because they know they’d be rejected? The NHS is terrified of these figures as they’d be spun out of all proportion by the media, but they’re needed to model demand properly. The NHS needs an adult conversation on demand and how it should be met, including what we expect the public to do themselves. It’s a weakness to continue scaling services by supply rather than demand.